If I am helping a parent find books for their child who is beginning to read, I would take them to our library’s Easy Reader section. But for children with dyslexia, reading is anything but easy. What can libraries do, then, to help support these children in their literacy development? 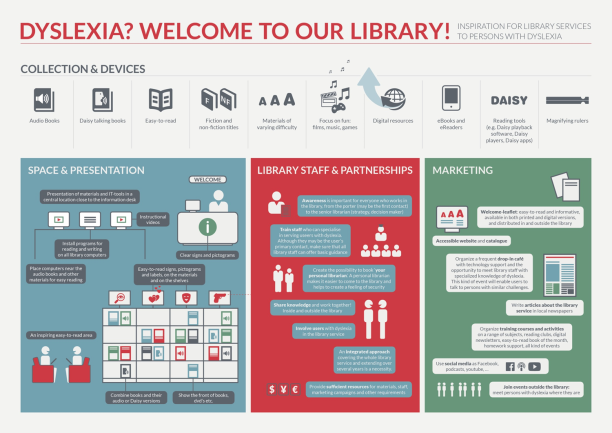 Librarians already have a road map to help them develop inclusive library services for individuals with dyslexia and other learning differences. The International Federation of Library Associations and Institutions (IFLA) has published a revised and extended version of their Guidelines for Library Services to Persons with Dyslexia. IFLA’s guidelines are intended as a tool for both trained and less experienced library staff members who are responsible for serving those with reading and learning difficulties. Public libraries and school libraries, along with librarians and teachers, can collaborate more to support children and teens with print disabilities by sharing resources and promoting each other services and collections. Libraries can use labels to connect books in print and in other format. For example, use a label ‘audio book also in the library’ to indicate that another format is available for checkout besides just the printed book. Encourage children and young people borrow both formats together so they can practice their reading skills by reading and listening at the same time. Offer extended loan periods to allow children more time to read library material. Provide magnifying reading rulers at the desk for in-library use. These help readers with learning differences additional support in reading by magnifying text with an added reading line. Provide awareness training to library staff with reminders to staff members that every child, young person and adult has the right to read and enjoy books. Looking to build your own background knowledge in dyslexia and other learning differences? Check out ASCLA’s Library Accessibility Tipsheet on Learning Differences. This tipsheet defines key terms, shares tips for working with those individuals with reading and learning differences, and provides examples of effective assistive technology applications for those with learning differences. Be sure to read Brianne Mintz and Professor Lisa Kropp’s recently published article “Creating Dyslexic-Friendly Children’s Libraries for more information and inspiration. This post addresses the following ALSC Core Competencies: I. Commitment to Client Group and II. Reference and User Services. Hello, the ASCLA library tipsheet link is broken. Hoping you can publish an update. Thanks! Is there a way to view that Infographic at the top any larger? It looks awesome, but I can’t read what it says.